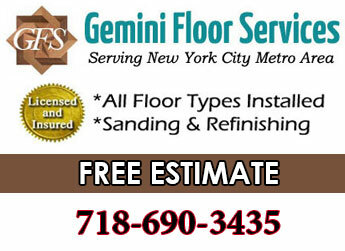 One thing we love about Brooklyn is the unlimited opportunity for flooring contractors. The city is constantly undergoing change. So many old buildings to renovate. Brooklyn has been undergoing a renovation boom we’ve noticed particularly since 2014. Especially in neighborhoods close to Manhattan such as Williamsburg. The neighborhood is known to have the highest level of gentrification. Since the 90’s rents have been on the rise and have doubled and tripled as of 2018. Not good for lower income folks, but for the flooring business it means plenty of work. In 1898 Brooklyn officialy became one of the 5 boroughs of New York City. The Williamsburg bridge to Lower Manhattan was completed a few years later. Throngs of escapees flowed in from overcrowded Manhattan quickly turning Williamsburg into the most populated neighborhood in the city. Hasidic Jews, Purto Ricans and Dominicans were the first to carve out their own neighborhoods in Williamsburg. Growth continued through WWII and after until heavy industry jobs declined in the 1960’s. Williamsburg then devolved into a crime ridden slum for some years. But in the 90’s the neighborhood began to rise up again as a hip and happening place. 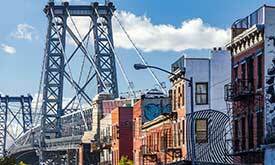 Like so many neighborhoods of New York City Williamsburg is rich with culture and historical landmarks. There remains the distinct presence of Hasidic Jews, Puerto Rican and Dominicans as well as Polish and Italian communities each in their respective areas. However, since the 90’s the interspersed presence of up and coming hipsters has gradually transformed the neighborhood into a hipster haven. It has become a sort of mecca for the young, trendy, creative and artistic. While median incomes in Williamsburg have soared, the area has become filled with hip restaurants, cafes, bars, studios, boutiques, galleries, theaters, dance clubs and other entertainment options. It has the most active nightlife scene in Brooklyn. Concerts and outdoor markets abound. Old factories have been converted into upscale condos with waterfront views of Manhattan. Take a stroll down Bedford Ave or Grand Street and you can clearly see how the neighborhood has been transformed from rough and gruff to trendy hipster style glitz and glam. You can be sure that inside these buildings are plenty of high end hardwood floors. 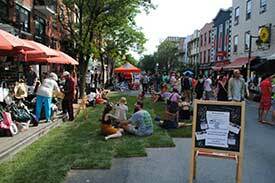 Grand Street & Bedford Ave are the main streets with shops & dining. Nightlife is big in Williamsburg. Best Pizza for some of New York’s best.